Training is all well and good, but what happens if an operator is asked to use an access platform with which they are unfamiliar? In this short guide, we answer some of the most commonly-asked questions about familiarisation. I have ensured that all my employees have undergone the correct IPAF training – so why do I need to worry about familiarisation? A PAL or PAL+ card indicates that an employee is qualified to operate certain types of access platform. However, the employee will only be comfortable and familiar with the makes and models that they commonly use. If they are required to use a markedly different make and model, they may not be as confident. Imagine you typically use Genie rough terrain scissor lifts, so you know exactly how the controls work and have a good feel for the platform’s performance. However, today you are going to use a MEC Crossover scissor lift. While your IPAF training has given you a superb understanding of scissor lifts in general, and you are familiar with diesel-powered Genie scissors, you have never used an all-electric MEC rough terrain scissor before. So if you are following best practice, you will undergo familiarisation before operating the MEC lift. How do I know whether or not familiarisation is needed? It is always best to err on the side of caution. 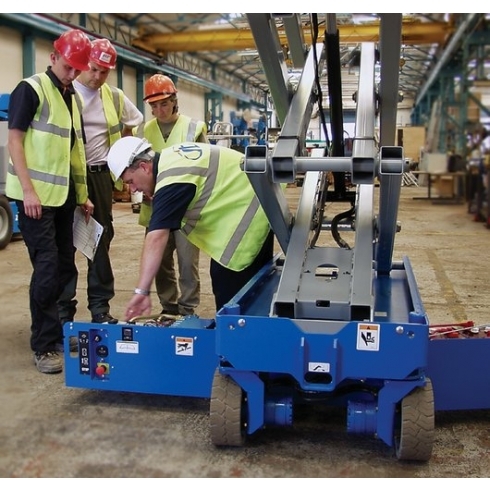 If key characteristics of the access platform significantly differ from an operator’s training, then they should undergo familiarisation before operating the machine. If the platform’s weight, height, width, length or even complexity of controls differ significantly from the machine on which your employee was trained, or frequently uses, then familiarisation is recommended. What does the law say about familiarisation? Under UK health and safety legislation, the employer has a legal responsibility to ensure that all operators are adequately trained and familiarised with the powered access equipment they are going to use. Information on all four bullet points above can be found in the operator’s manual supplied with the platform.